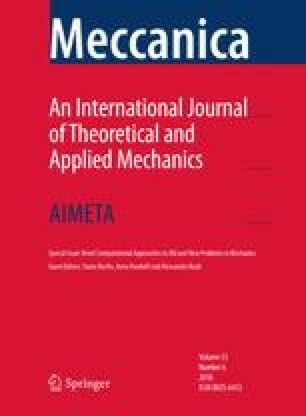 In the present paper the non-linear behaviour of a solid body with embedded cohesive interfaces is examined in a finite displacements context. The principal target is the formulation of a two dimensional interface finite element which is referred to a local reference frame, defined by normal and tangential unit vectors to the interface middle surface. All the geometric operators, such as the interface elongation and the reference frame, are computed as function of the actual nodal displacements. The constitutive cohesive law is defined in terms of Helmholtz free energy for unit undeformed interface surface and, in order to obtain the same nodal force vector and stiffness matrix by the two integration schemes, the cohesive law in the deformed configuration is defined in terms of Cauchy traction, as a function of separation displacement and of interface elongation. Explicit expression of the nodal force vector is integrated either over the reference configuration or over the current configuration, which is shown to produce the same analytical finite element operators. No differences between the integration carried out in the reference and in the current configuration are shown, provided that elongation of the interface is taken in to account. The financal support of the Italian Ministry for University and Research (MIUR), under the Grant PRIN-2015, Project No. 2015LYYXA8, “Multiscale mechanical models for the design and optimization of microstructured smart materials and metamaterials” is gratefully acknowledged. which represent the index notation of Eq. (25a). The latter equality in Eq. (56) is based on the relations between normal and tangent unit vectors (\(n_1=t_2\) and \(n_2=-t_1\)) and it is equivalent to Eq. (38a). which is equivalent to Eq. (38b).